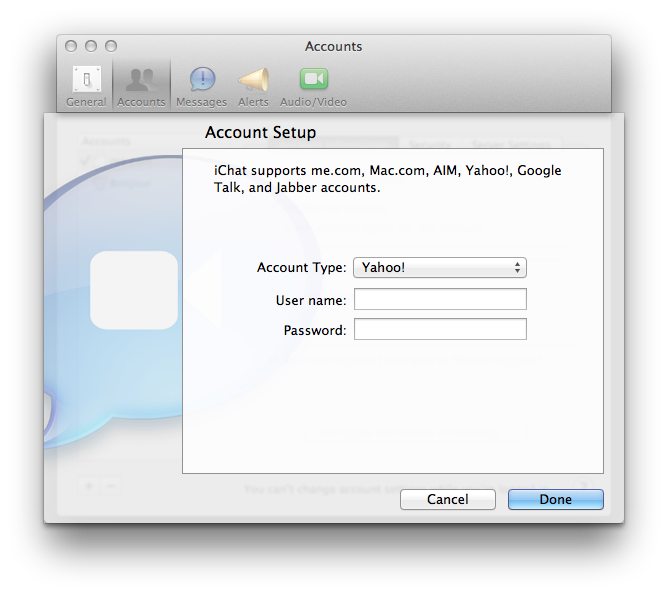 Is it possible to configure Yahoo Messenger on iChat? There are options in iChat to configure Google talk, yahoo messenger, AOL etc. So far I know it is possible to configure Google talk. But I did not get any document or evidence to configure Yahoo Messenger. I do not know why? Is it possible to fix this problem??? I am talking about Mac OS X Lion. You will need to sign up for a Yahoo! account by going here. Enjoy using iChat with Yahoo. This method works for text chat. iChat claims to support video and SMS via Yahoo, but used the method above to configure Yahoo, and I got no option for video chat. Any more ideas?